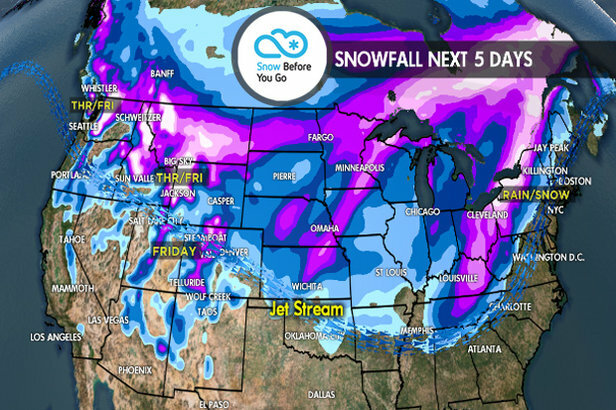 Snow continues across the West with an active jet stream over the next five days. In the Northeast, warm initially and then one large storm system for the weekend with rain and snow. Wyoming, Montana, Idaho: A storm system delivers moderate to heavy snow accumulation on Thursday and Friday. Lingering light snow on Saturday. A fast moving cold front dives in Sunday night continuing on Monday with light snow accumulation. This should be a great weekend for powder skiing at Schweitzer, Big Sky, Discovery, Jackson Hole, Grand Targhee and Sun Valley. Pacific Northwest: The moisture feed continues over the next five days. An abnormally large, wet storm system arrives on Thursday. Heavy snow is likely in the high Cascades and volcanoes. 1-3 feet of accumulation is possible from that storm system alone. Drier on Sunday with a storm system possible on Monday, Tuesday and Wednesday. Whistler Blackcomb: The moisture feed continues over the next five days. An abnormally large, wet storm system arrives on Thursday. Heavy snow likely. Drier on Sunday with a storm system possible Monday, Tuesday and Wednesday. Northeast: Dry and warm initially ahead of a large storm system with rain possible on Friday. The rain changes to snow on Saturday at the ski areas. Colder air settles in for Sunday with sunshine. An Alberta Clipper is possible for Tuesday with light snow accumulation. Colorado, Utah: Residual light snow continues on Thursday in both states. A fast moving storm system arrives on Friday with wind and light to moderate snow accumulation. In Colorado, it favors the Central and Northern Mountains. 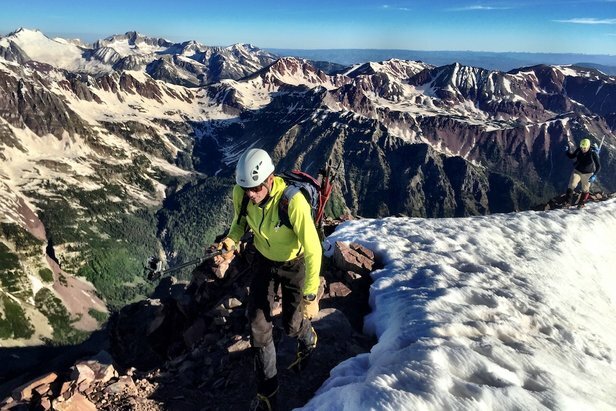 In Utah, it favors the Wasatch and north. Drier on Saturday and Sunday. A cold front dives in Monday night continuing on Tuesday with light to moderate snow accumulation. California: After some lingering light snow on Thursday the pattern turns much drier through the weekend. The next chance of snow arrives Monday night into Tuesday. Tomer's Take: Ski Sun Valley or Schweitzer on Friday, Snowbird or Steamboat on Saturday and Whistler Blackcomb on Sunday.